A diverse group, the members of Peoples Temple shared a common goal: to create an egalitarian society free of problems of class and race. Many of those who joined in Indiana in the 1950s had lower incomes and felt alienated from society. In contrast, those who joined in California in the 1960s and 1970s were more affluent, middle class professionals. In both parts of the country, Peoples Temple was racially mixed and whites were in the minority. Children of the Peoples Temple. In Indianapolis, Edith Cordell wanted to replace a pet monkey and saw an ad in the paper placed by Jim Jones who was selling pets to raise money for a church. “So she went over and she bought 'em — a boy monkey and a girl monkey,” her nephew Gene recalled. “Jimmy started telling her about his church.” Aunt Edith joined and recruited a number of family members. Gene and his wife became disillusioned after Jones returned from seeing Father Divine and made grandiose proclamations of his own divinity. But Edith and about 20 other Cordells followed Jones to California in 1965. Twenty members of Gene Cordell’s family died in Jonestown. Aunt Edith left her entire estate to Jim Jones. 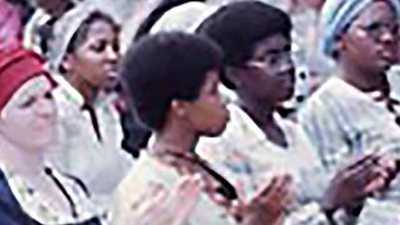 The Lewis Family In San Francisco, an African American woman, Doris Lewis, had been a devout Baptist all her life before friends brought her to Peoples Temple. The Temple gave her hope for a better world. It offered excursions to ride horses or go swimming, experiences that her children would not have had otherwise. Her husband Fred resisted — like Gene Cordell he sensed blasphemy in Jones’ rhetoric — but he thought his 17-year marriage was still strong. Then one day his wife didn’t show up at her job at the post office. With the help of Peoples Temple members she cleared out the apartment and took all seven kids to Guyana. Fred was devastated. He received six letters from one of his daughters but was unable to contact the rest of his family. Soon after November 18, 1978, Lewis found out that his wife and children, as well as 19 other relatives, all died at Jonestown. Tim Stoen, an assistant district attorney, joined Peoples Temple in Redwood Valley. He brought his wife Grace into the group; with their professional skills, they became pivotal to its growth in California. In 1972 Tim Stoen signed an odd document that concerned his newborn son, John Victor Stoen. 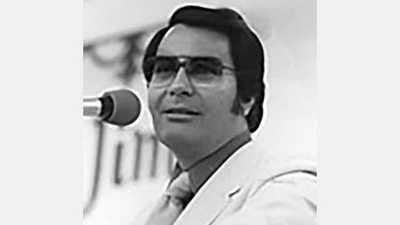 According to the statement, Tim had been unable to conceive a child and asked Jim Jones to impregnate his wife. Four years later, Grace Stoen fled the temple, abandoning her husband and son. Grace’s effort to reclaim custody of her son was one factor in Jones’ decision to abscond from the United States to Guyana. Tim Stoen left the church in 1977 and reasserted his paternity of John. The Stoens traveled with Congressman Leo Ryan on his trip to Guyana and were in Georgetown when the massacre occurred and their son was killed. The work was hard in Jonestown and the conditions difficult, but for many Temple members, the utopian experiment was successful. The elderly were cared for and active in the community. 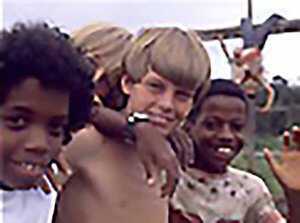 Children were raised by communally to grow up without racial prejudices. Each member contributed as much work as he or she was able and (as far as he or she knew) shared their production equally. For many members, life in Jonestown was an opportunity to create and live in a society that other people aspired to but never achieved.